Kill la Kill defies comparison. It’s from the writer and director duo that brought us the beloved Gurren Lagann and it reads a lot like the classic Revolutionary Girl Utena but come into Kill la Kill expecting a series like those two and you’ll be disappointed. It’s its own animal, albeit with a twist of parental DNA from Hiroyuki Imaishi, but even still, part of the fun is in starting each episode thinking I know what’s coming, only to have all of those expectations shoved back down my throat. Again, that’s all a part of the fun in watching Kill la Kill. It’s a cleansing agent for those of us who need reminding that our ideas of what anime is, or should be, amount to nothing in the face of such a raw creative force. In that sense, Hiroyuki Imaishi is a lot like Masaaki Yuasa, but where as Yuasa’s avant-garde aesthetics will always render him an outsider, Imaishi’s much more adept at pulling the wool over the typical anime fan’s eyes. Neither director is afraid of the odd fart joke either, and I suppose it’s that utter silliness that still surprises me the most. Gurren Lagann was silly at first too, but after that certain spoilerific moment, everything changed. Rightly or wrongly, I’m expecting the same of Kill la Kill too, and deep down, I’m even hoping for it. Is there a story beyond this school? A villain beyond Satsuki? It’s for those reasons that each new episode feels like another pie in the face from Imaishi and writer Kazuki Nakashima. The more I scream, “take this story seriously, man!” the more I’m rebutted with a fourth wall breaking farce and animation that’s anti-realistic. 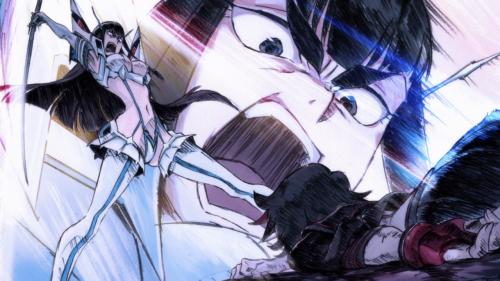 In a strange way, I love that Kill la Kill attacks me for daring to take it seriously. The use of fan-service is just another example of that anti-x attitude. Although Revolutionary Girl Utena is loaded with sexual undertone, it has an elegant, subtle aesthetic, and given the prominent billing of its female leads, many will have been expecting the same of Kill la Kill too, but here the girls are forced to fight scantily-clad in-front of crowds of ogling students. That’s the moment at which I’ll usually drop a series, but Kill la Kill makes a point of expressing both Ryuuko’s embarrassment of her naked body and Satsuki’s willingness to expose her’s in exchange for an awesome power. By acknowledging it, by making it a part of the story and a choice on the behalf of the characters, it has fan-service that isn’t really fan-service at all, but you’ll need to square that notion with the part of your conscience that’s telling you that this is demeaning and perverted. Because it is, but it’s everything else as well. I find it silly and ridiculous and most of all, ironic, that people who are hung up with fanservice are just rationalizing away and enjoying Kill la Kill. I mean how stuck up do you have to be to enjoy it? Not saying anyone here is stuck up, but that’s how it comes across. The comment about Yuasa is appropriate–because he doesn’t pander he is rendered inaccessible. I guess that’s just how this game works. It’s not about being “stuck up” at all? I just think there’s an interesting conflict between a story that’s about strong women and an aesthetic that has them being objectified. As quoted in the post above, it’s Kill la Kill itself that’s rationalising those choices (which is pretty cool anyway, since it’s rare to see anime with this level of self awareness,) I’m more just trying to make sense of why I’m okay with it, and I think it’s precisely because the series is so self aware and therefore, a parody, too. 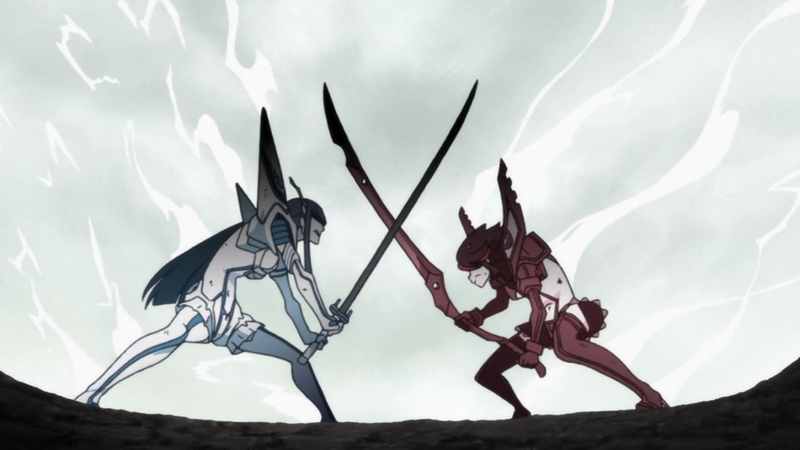 I guess that’s it, amongst many other things, Kill la Kill is a parody of fan service anime. Never heard of this at all until I saw your post. I didn’t have time to watch it but saw a few clips on Youtube. I think it mocks itself in the most self-aware, self-conscious and self-deprecating way. It takes a certain mindset to appreciate its humour and over-the-top-ness. It is, as you say, it’s own animal. I don’t know if anyone was surprised by this show. It’s pretty much what we expected. Lots of wild, over-the-top action and lots of fanservice, put together extremely well. There are other things bubbling under the surface (the whole godrobe thing and how it relates to “Nudist Beach,” for example) but apart from the endless references to older shows (so I’m told) they depend on the story to reveal themselves, so apart from the aforementioned action and fanservice, the jury’s still out, at least for me, on whether it’s trying to SAY something or just be a fun-as-hell romp. Well, if you’ve seen Gurren Lagann, you can pretty much immediately see where the show is going in terms of messages. As far as I can tell. I mean, if you pay attention to the opening, there’s a part where two red figures join hands and the shot pulls back to reveal they’re two parts of a huge grid in the sky that Ryuuko is looking up at. This is extremely reminiscent of Gurren Lagann and what the show is largely about so. Among many other things, I take this to mean that the show is definitely heading in the same direction as TTGL but while retaining it’s own unique… uniqueness. You know? So yeah, I think this will go way beyond Satsuki like it did with Lordgenome. I think that’s what we got a glimpse of when Satsuki’s mother called. But I also think (hope) that Satsuki and her elite four will end up playing a better role in the final battle considering Satsuki’s character. You know, when I first saw it, I thought, “Oh, it’s just a tough girl.” Then five minutes in, I got hooked on the pacing. It’s a free-wheeling comedy that forces a lot to happen in a twenty-minute interval. Of course it’s going to be silly! What we see here is a reflection of what’s good in any entertainment medium, and it’s one of the few that I look forward to each week.